I have always been a breakfast person. There is no way that I could start my day without eating something for breakfast. Take a look around this blog and you will see that I definitely love my breakfast foods. It all started when I was a kid. My mom wouldn’t let us out of the house without eating breakfast in the morning. That has stayed with me throughout all these years. 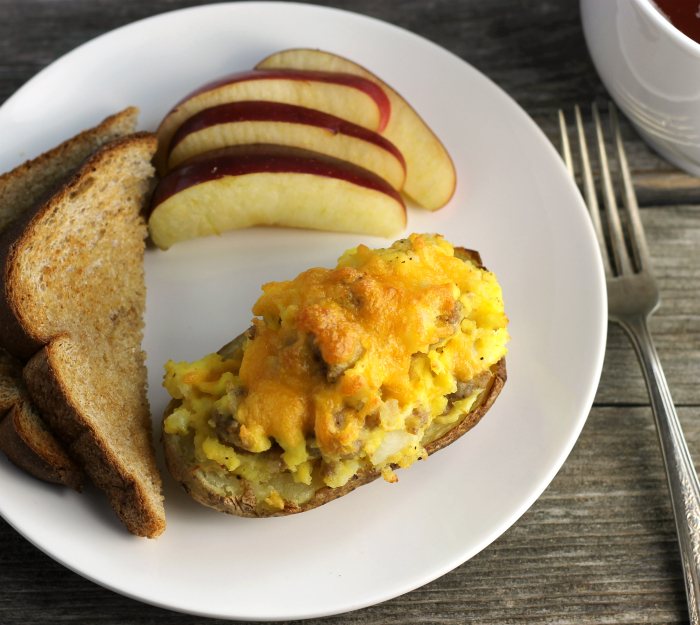 Stuffed breakfast potato skins are one of my new breakfast favorites. Mike and I are people that love to eat eggs and potatoes. 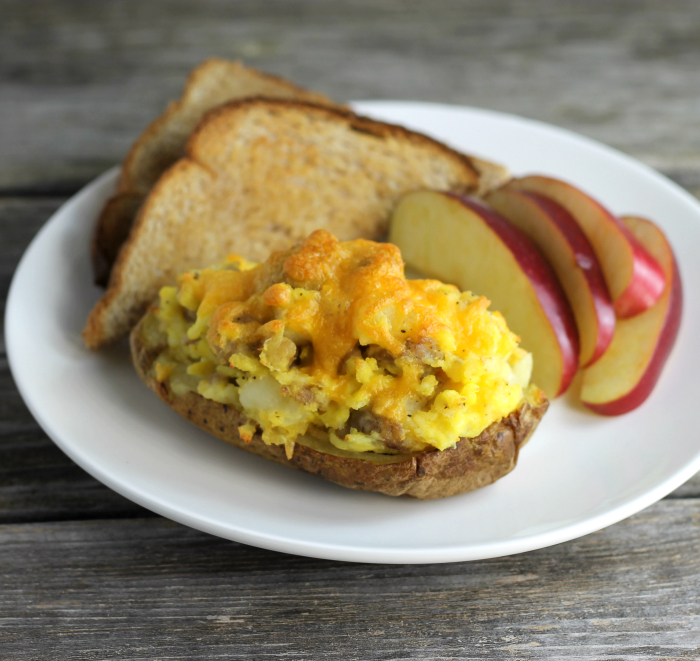 It is not uncommon to find us eating eggs and hash browns for a quick dinner during the week. Yes, we love breakfast foods for dinner, but we also love to eat them in the morning. Usually, that happens on the weekends. I decided to make these stuffed breakfast potato skins for breakfast on Sunday morning. They are a little time-consuming, so they are perfect for that morning when I don’t have a lot going on. I started out with microwaving the potatoes until they were fork tender. Then the potatoes are cut in half and the most of the potato is scooped out. 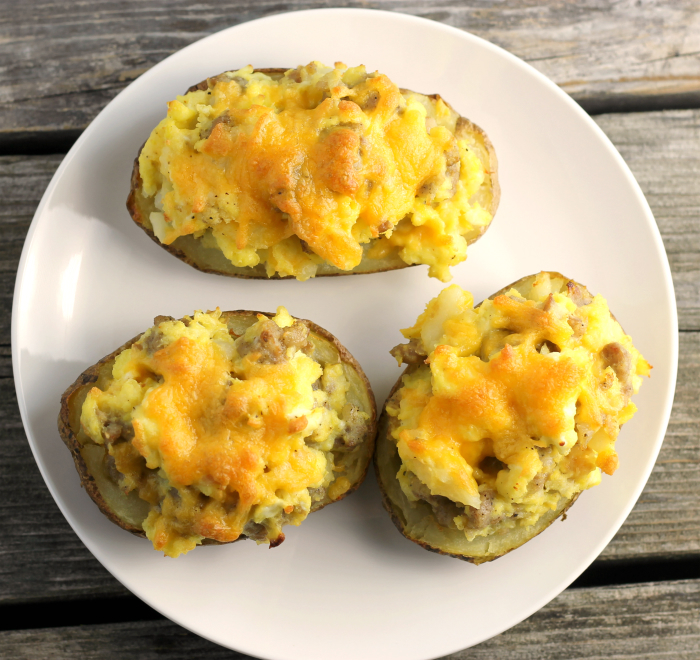 These stuffed breakfast potatoes skins are then stuffed with the potatoes, pork sausage, eggs, and cheese. It is a super delicious way to start your day. 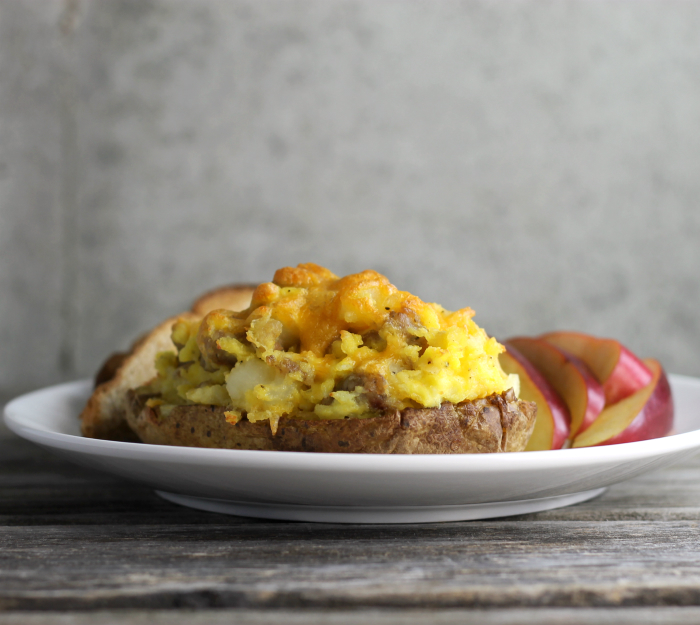 If you like these stuffed breakfast potato skins you make enjoy these too. Microwave 2 russet potatoes, until fork tender. The time will depend on the size of the potato. Once they are microwaved, remove and cool. Once they are cool enough to handle cut in half and scoop most of the potato out leaving a layer of potato on the bottom and sides. Place the potatoes skins on a baking pan that has been sprayed with non-stick cooking spray. Spray the potatoes skins with the non-stick cooking spray lightly. Place them in the oven that has been preheated to 375 degrees F. Bake for 12 to 15 minutes or until the skins are turning brown. Cook the pork sausage while the potatoes are being microwaved. Remove the sausage from the skillet and discard the grease. To a skillet add one tablespoon of butter and melt over medium heat. Add the potatoes that were scooped out of the potatoes and brown lightly. Take the eggs and beat the milk until well mixed. Add the pork sausage, eggs, and cheese into the skillet with the potatoes. Cook until the eggs are set. Divide the egg mixture between the four potato skins. Top with additional cheese. Dawn these look yummy delicious !! Tim and I are breakfast for supper too. We had it tonight, before hitting Barnes. So yum. I too LOVE breakfast…this looks fantastic, Dawn. I must have breakfast, too! Boy, this looks like one winner of a way to start the day! Bill would be thrilled if I’d make these!! !